Photo By © Eric Hunt and his Orchid Photo Website. Plant and Flowers Photo by Dale and Deni Borders. 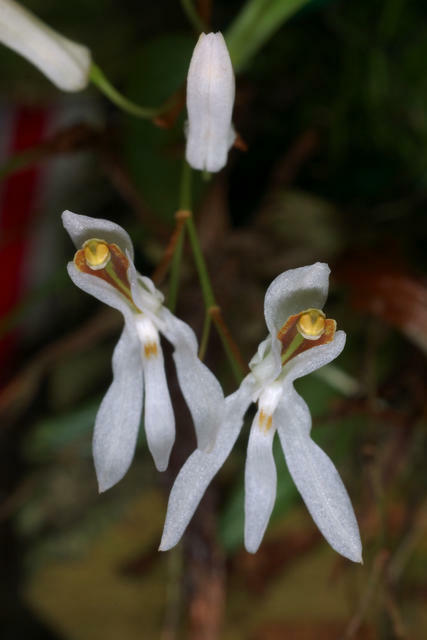 A miniature sized, cool to cold growing epiphyte from the eastern Himalayas, Assam, Nepal, Bhutan, Sikkim, Myanmar, Thailand, Laos, southern China and Vietnam at elevations of 1500 to 3300 meters with close set, narrowly ovoid to ovoid pseudobulbs carrying 1 to 2, lanceolate to elliptic-lanceolate, plicate, acute, petiolate base leaves that blooms in the fall on a terminal, decurved, laxly 5 to 8 flowered, slender, 1.2 to 1.8" [3 to 4.5 cm] long, racemose inflorescence that is basally sheathed and has ovate, acute membraneous, persistent floral bracts all arising on a new growth.